Are you ready for a change? If you’ve been riding the Marie Kondo tidying wave like me and so many around the world, I have a hunch you may be enjoying some surprisingly blank corners of your home and closet. Am I right? Now here’s a question. What to ADD in once the clutter has been thanked and respectfully tossed to the curb? I have something to show you! Whether you’re looking for a new piece to spark joy and creativity at your office, something to make you smile on the wall in your kitchen during that precious first morning coffee, or a colorful piece for your kid’s bedrooms I think you may want to have a peek at this little gem of a catalogue. 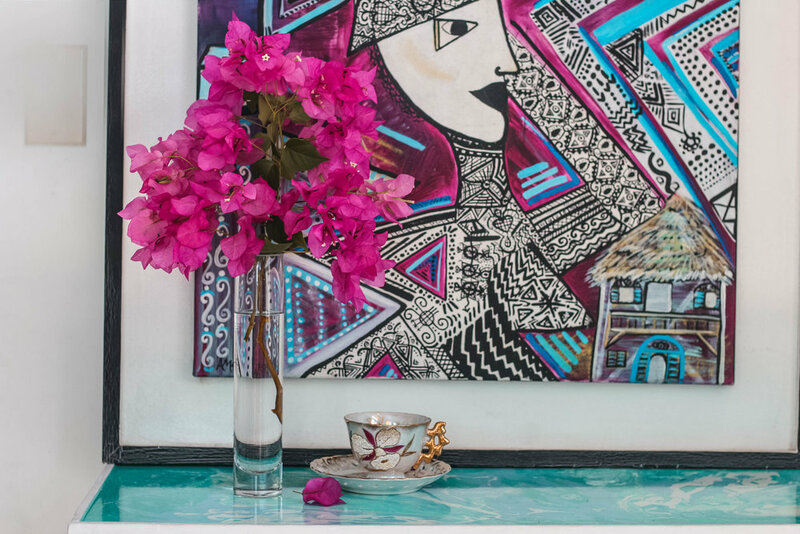 All 21 pieces of original art were painted at my studio in Port-au-Prince or my mothers home, Chic Chateau Haiti. They reflect the emotions, inner journeys and discoveries I’ve made between 2016-2018 and range in size from 12 x 12” to the extra (ultra?) large creation goddess pictured above. As always, I’d be happy to ship a piece to you anywhere in the world. I ship with DHL, and have sent pieces as far as California, British Colombia and Beijing. 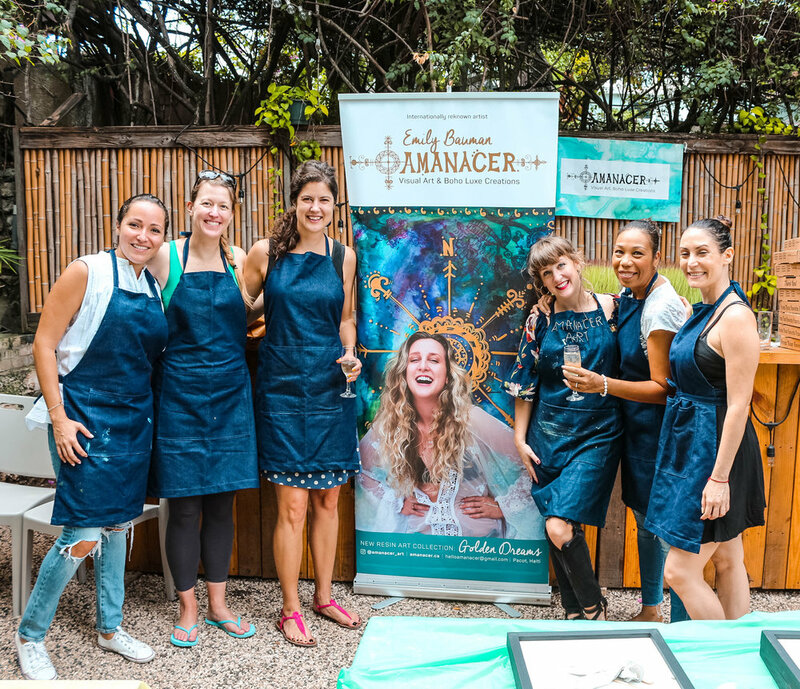 Will you be joining the hundreds of happy Amanacer Art collectors who spark joy with their paintings each day? Hit me up at HelloAmanacer@gmai.com if you connect with a piece you see in the catalogue. I’m happy to let you know I can accept Paypal, money transfers and credit cards so the only limit is your imagination and how you want your space to feel every day. I have a feeling they’ll move fast so don’t hesitate. Amanacer here, in Haiti. I was recently handed a copy of the book “Secrets of the Millionaire Mind” by wise little sister Victoria Bauman (thanks, sis!) . One of the key takeaways from T Harv Eker shares is this epic advice, which I’ve turned into a poster for my office and want to share with you all too! BONUS: Colour edition. If you’re a baller with a colour printer or want to send it off to a local print shop, then look no further because I’ve also created this 18x 24” version for you. Here’s to your exponential growth, infinite beings! P.S. Have we connected on Instagram yet? Amanacer here in Haiti. I recently gave a cheap IKEA table a major makeover and some of you on Instagram asked for the recipe. So here’s my secret formula in 8 easy steps, pro tips included, just for you. White Acrylic Paint. Any variety will do! A closed box or hard lid to allow your table top to dry without dust or bugs getting in the mix. This is super important to achieve a glossy, smooth, bug-free finish. Trust me. By the way - I have no affiliate links with the stores above. I just think their product are the best and recommend them to you because it’s what I use after years of testing out the market. Muah. This is my typical resin art setup at the home studio here in Haiti. Lots of air flow is important is key when working with epoxy resin and blow torches. Watch this Resin 101 Video if it’s your first time working with this sticky stuff! Add a dime size of white paint and 10 drops of alcohol inks into 4 of the cups. One color per cup. Pro tip: Stir the paint and ink together lightly for a marbled effect. Stir it thoroughly for a solid effect. Mix your cups of paint and dye, then pour them freely over the IKEA table top. Once you’ve got a solid base, pour transparent resin on top, and layer more colors on top of the transparent resin. Torch slowly over the entire surface with the blowtorch to remove bubbles. That’s how it gets glossy and gorgeous AF. Don’t light it on fire now! That’s a thing. Pro tip: continue to torch it periodically for the first 4 hours, every half hour. Those bubbles are damn sneaky and can try to pop up after you’re supposedly done. LET GO, LOVES! Resin is a flowing substance with a mind of it’s own. As it begins to harden it will stay in place more or less as you pour it. But a big part of playing with resin is letting go and embracing where it ends up. So for all my control freaks and A-types, it’s a great lesson in loosening up and letting it slide into it’s own idea of perfect. Mkay? Thanks for stopping by. Have you said ‘hey’ over on IG yet? My friend Chantal recently came to visit from Canada. 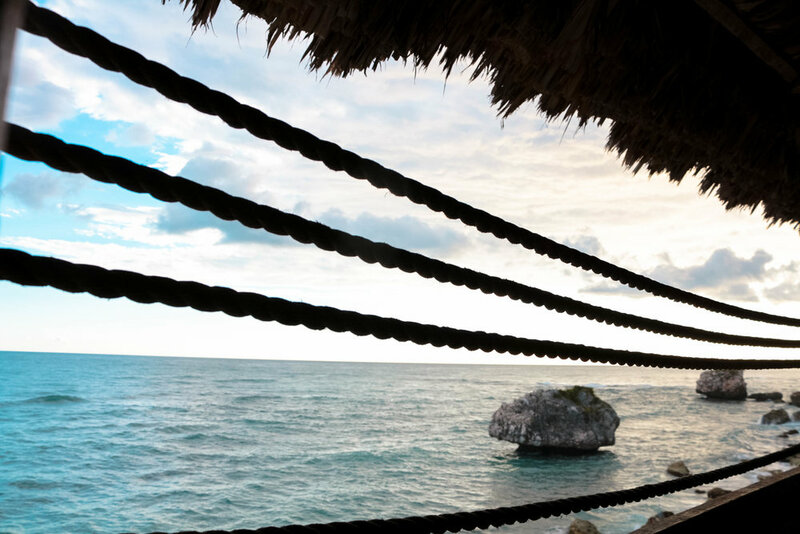 We hired a local fisherman in Jacmel, Haiti to take us onto the open sea at sunset. We had some sandwiches and a cheap bottle of bubbles to swig from as the sun burned from red to orange on the horizon. Inevitably, we became the cliche girls toasting to the simple pleasures Haiti brings and giggling as pure joy makes you. Before it was time to return to shore I dove into the mercury colored water that flowed like liquid silver. 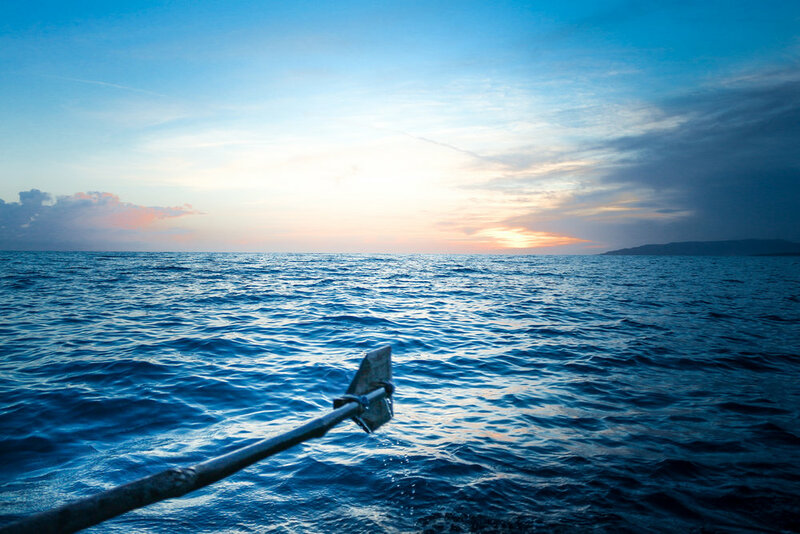 This photo reminds me of the gnarled hands of our oarsman, Beke, and the feeling of bliss from being on the open sea. It's moments like this that keep my creative spirit overflowing. 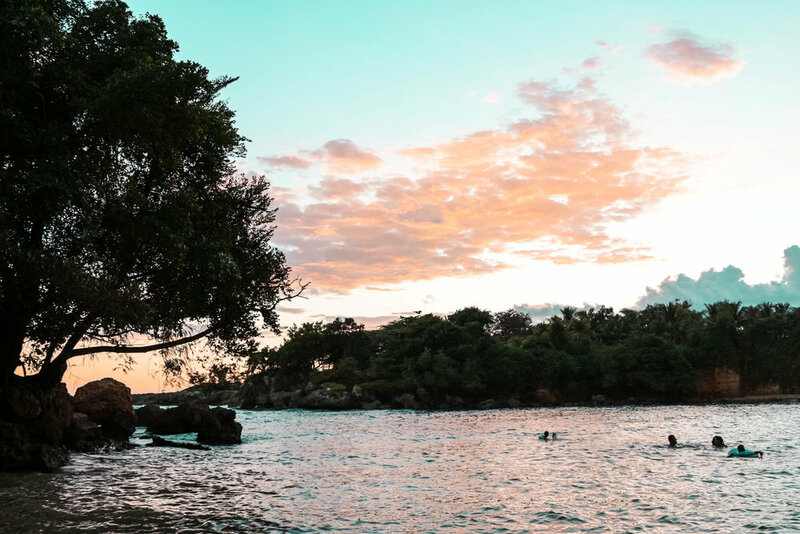 They remind me of the joys that lie outside Haiti's capital, far beyond the political drama and dust of men, into the sea where only mermaids and oarsmen can reach. Here's hoping my little adventure uplifts you too. Introducing the Summer Sirens, a mermaid themed art show by painters Amanacer and Jameson Martelly. Find us from June 26 to July 3rd at La Lorraine Boutique Hotel in Port-au-Prince for amazing art and free comedy shows from LOL Fest. Laughter, Fabulous Art and Celebrating our Mothers for Charity? Join me May 26 at Karibe Hotel, in Haiti. Plus read on for a sneak peak of my latest work. Introducing a new workshop: Paint Yourself as a Mermaid. It's fun. It's free. You can download the guided workbook. Or join the in-person class in Haiti this Saturday April 21st. If you know me at all, you know I've been painting mermaids since about the age of 10. It's been a way to create self-portraits, while hiding behind the mermaid's symbolic presence. Now it's your turn! What better way to spend an hour or two on a Saturday morning or Sunday afternoon than dreaming of your life as a mermaid? What symbols, superpowers or home would you paint? Basic instructions on how to paint yourself as a mermaid can be downloaded at the link below for free. Are you in Port-au-Prince, Haiti? 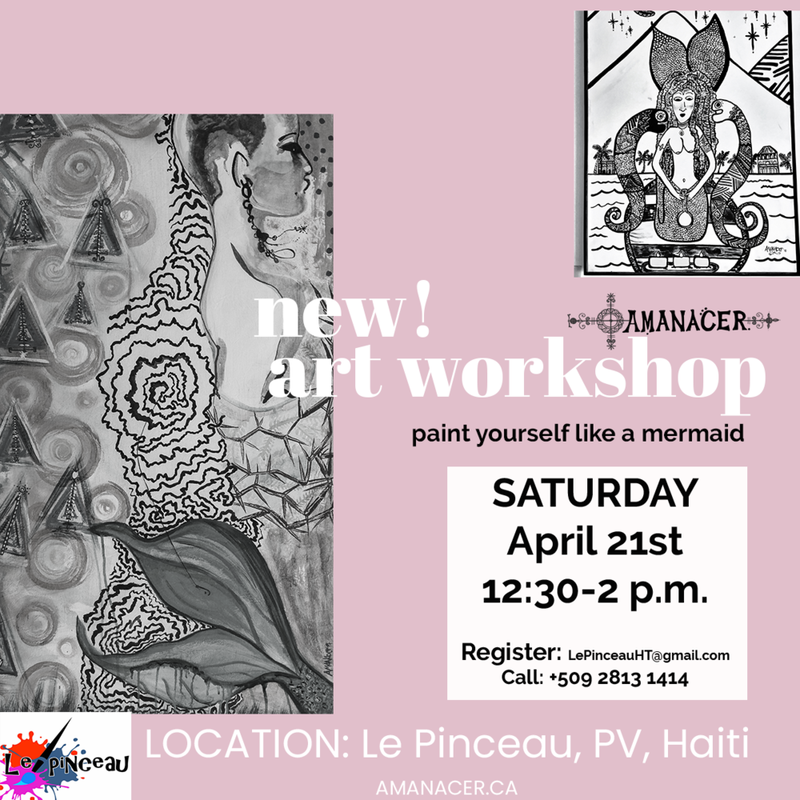 The live workshop with guided instruction is happening this Saturday at Le Pinceau, in Complexe La Promenade in Petion-Ville. To register for the in-person class this Saturday from 12:30-2pm in Petion Ville, please email LePinceauHT@gmail.com or call Joanne at +509 2813-1414. I can't wait to see you all! Six easy steps will take you from a basic outline to a singular painting, all your own. For inspiration: these are just for possible positions, symbols and patterns. This is not paint by number or a coloring book page. You'll have to dig deep and use your imagination. Complete the workshop at home, for free! You asked for it on Instagram, lovelies, so here you go. Here's the link to your very own free workshop PAINT YOURSELF AS A MERMAID to complete at home. Use it once; use it twice; but, above all, please use it. I hope it unlocks a new found creative threshold for you. It's back! 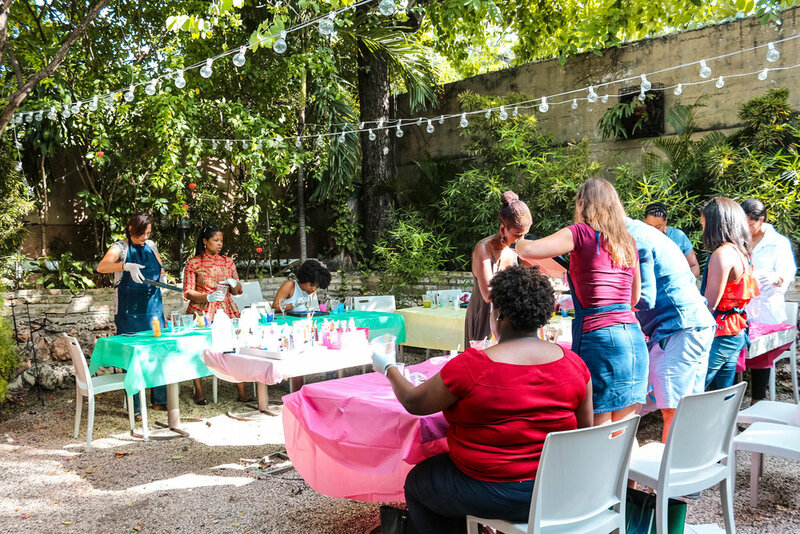 A Sip & Pour Class in Haiti at Galerie Monnin. Back by popular demand. Join me Sunday March 25th at the luscious Galerie Monin in Port-au-Prince, Haiti for an exclusive Sip & Pour Resin Class. Pure fun. Zero experience required. Create your own. $70. All supplies included. Create your own for $100. All supplies included. Please email HelloAmanacer@ gmail.com to reserve your spot! This week Haitian it-girl Matti Dominque poses with my Urban Mermaid & Wishing Wall Mural, sparking others to share and post #WhatsYourWish? Or in Creole, #KisaOuSwete? Check it out! Location: Exterior Wall of Le Plaza Hotel - Champs de Mars, Downtown Port-au-Prince, Haiti. Find it at the intersection of 10 Rue Capois and Rue Saint Cyr before the hotel's parking lot entrance. What's YOUR Wish for 2018? Jerry and his daughter celebrate as we finished the final touches on the mural last weekend. This past weekend we brought a new piece of world-caliber street art to Port-au-Prince. A 5 day collaboration between Amanacer Art and Moise Jerry Rosembert "Jerry Graffiti", called "The Urban Mermaid and the Wishing Wall". 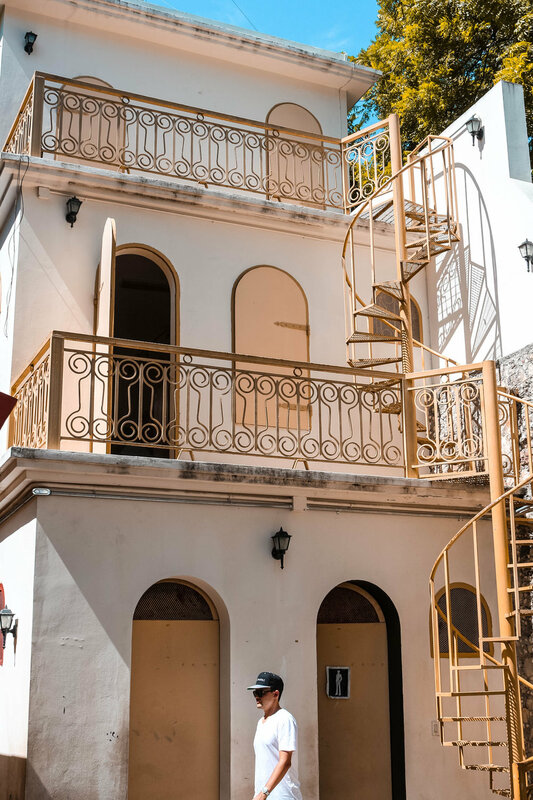 If you'd like to visit, it's located at the corner of Avenue St Cyr and Rue Capois just off the Champ de Mars on the exterior wall of the historical Le Plaza Hotel. We like to think of it as not in the hood, but "hood adjacent". Thanks to everyone who came by to write their wish for 2018 on the wishing wall! We also wrote down the wishes that had been messaged to me from a special tribe located everywhere around the world from New York to Bali. Gotta love Instagram and Facebook for that. 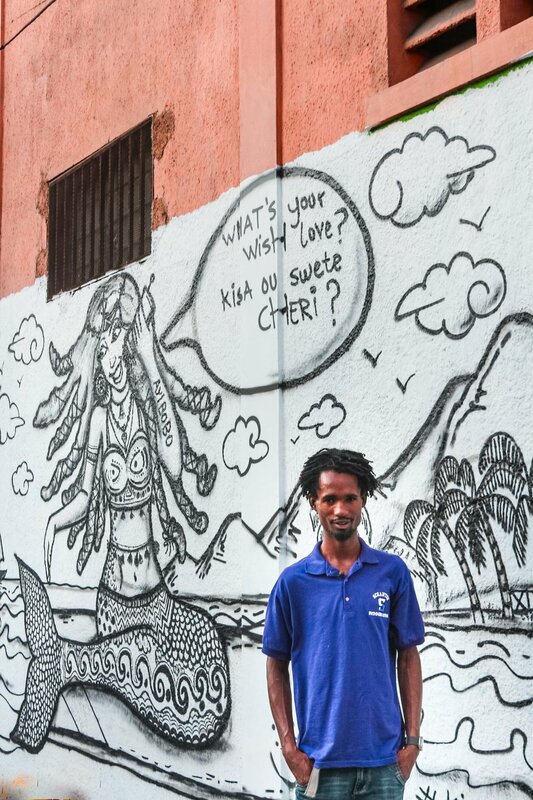 The Urban Mermaid and Wishing Wall were created in the context of the 5th Ghetto Biennale Arts Festival "Cartographie de Port-au-Prince." The concept started from my desire to map the contemporary understanding of the Haitian vodou goddess "La Sirene" in the city and beyond. When we first meet, people often assume that because I'm white, that I know little to nothing about Haitian culture. 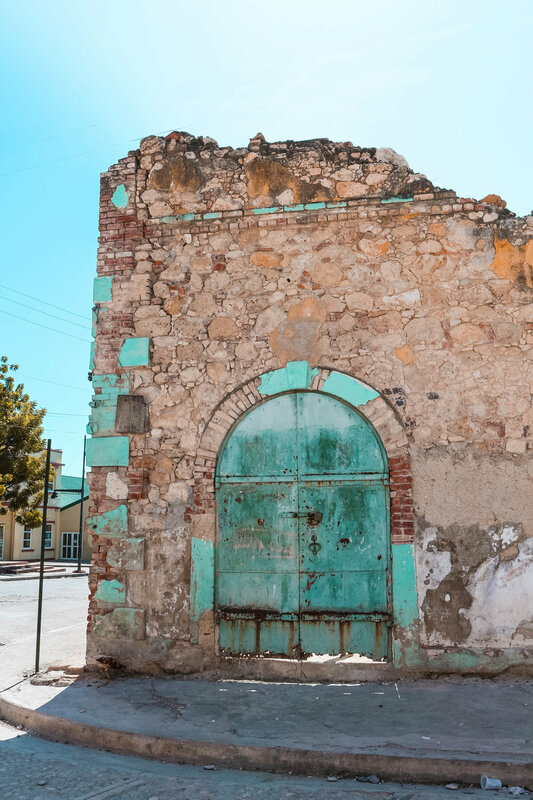 The truth is, a profound curiosity and need to understand has driven me since early childhood to independently study Haitian art and the religions like vodou that so strongly influence it. I was just seven years old when my family permanently relocated to Port-au-Prince. That's grade two. Kids can be cruel at any age, but as a very blond outsider I needed to quickly get up to speed, to learn creole, folklore dancing, ballroom dancing, and everything else about my environment to adapt. For me art was a natural fit, and some of my very earliest representations were of veve symbols off my household gate, and the mermaids I heard were seen swimming in the seas around Les Cayes and the rivers of Jacmel. Why the mermaid obsession? Did I watch The Little Mermaid one too many times? It's not that simple. Mermaids, for me, beyond the sensual freedom, luck and feminine power they represent also a symbol of yearning. You see, mermaids need no passport to travel the world. They intrinsically belong to a single home in the sea, and no one would ever question their nationality, or ask "where are you from?" If only that would be the case for me. I think, looking back, there were a lot of wonderfully elements to the mermaid archetype and the Haiti-specific mystical representations of LaSiren that drew me to her. The element of freedom from constraint of cultural specificity, of being at home in the deep, that feeling of escape into the deep, they all inherently and forever bind me to her flowing tresses. I've gotten more at home in my own culturally complex skin these past 3 years. Coming home to Haiti, and claiming my own sense of self has had a lot to do with that. When it comes to street art and film, this is my very first project. It's a declaration of what I'd like to deep-dive into on the creative front and how I can stretch my outer limits. Besides Jerry, who'se been doing street art for 15 years, I'm grateful to be collaborating with Moise Pierre (film maker), Luc Segur (documentary expert from Muska group) and Isabelle Vasquez (writer/journalism) in bringing La Siren Urbaine to life thus far. The film that comes out of our interviews is still taking form in my imagination but the answers we've received to our mermaid-related questions are fascinating! They range from everything to "No, I don't believe in mermaids" to "Yes, in my family we have an affinity to the mermaid goddess and my great-grandmother was taken down to the depths by La Sirene before she was released to us 3 days later. Plus she came back with a sea-shell encrusted comb." Now that's a story. Pictured: Moise Pierre, Amanacer (Emily Bauman), Isabelle Vasquez, and Luc Segur of Muska Group. Just missing Jerry! Until next post, thanks for being here and don't hesitate to leave your comments below! 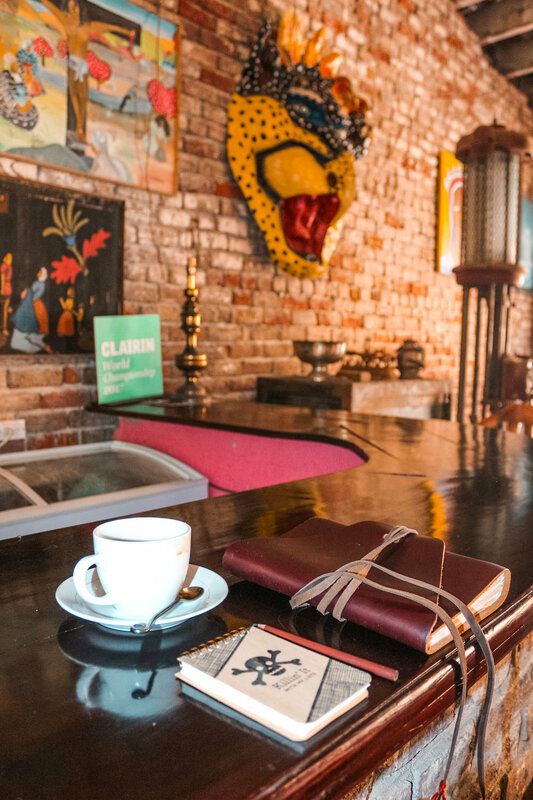 We're making world class art, inspired by the streets of downtown Port-au-Prince. Will you help ? What's more exhilarating than doing something for the first time? Something fun, that you think you secretly might be good at? That was my experience on this project. This interactive mural is part of the official program for the Ghetto Biennale 2017 Arts Festival, happening between Dec 11-17 in Port-au-Prince Haiti. It's situated on the exterior wall of Le Plaza Hotel, who kindly sponsored the artwork. The Amanacer Art concept for "La Sirene Urbaine" was executed in collaboration with local superstar Jerry Graffiti who has only recently thrown off the cloak of anonymity after 15 years. Artist Amanacer (Emily Bauman in pink) progresses on the mural's finer details with a paintbrush. Venez ajouter vos souhaits et désirs sur une mural vivante! Rencontrez une sirène urbaine et posez pour une photo avec elle. Participez à un tournage d’un film sur les mythes de sirènes et ‘Simbi » en ayiti. 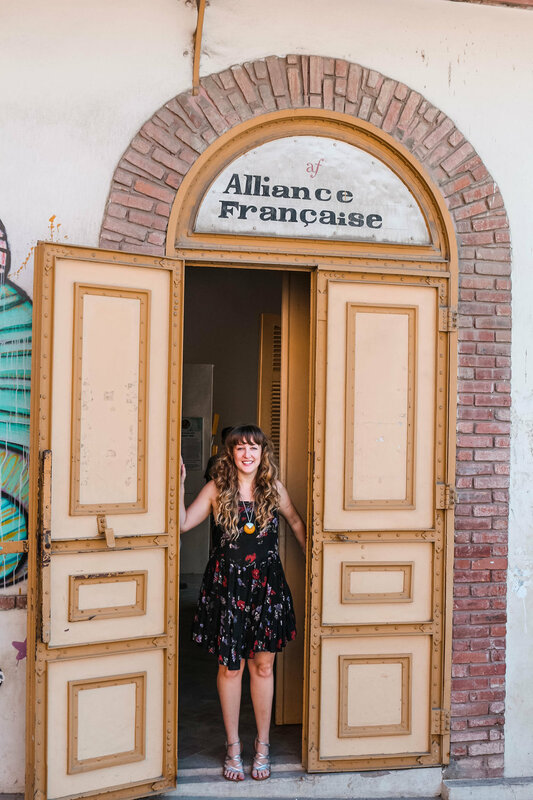 On vous donne rendez-vous devant Le Plaza Hotel Ce vendredi 15 décembre dans la matinée et samedi 16 décembre après-midi, pour ces activités culturelles autour du Mural « La Sirène Urbaine ». 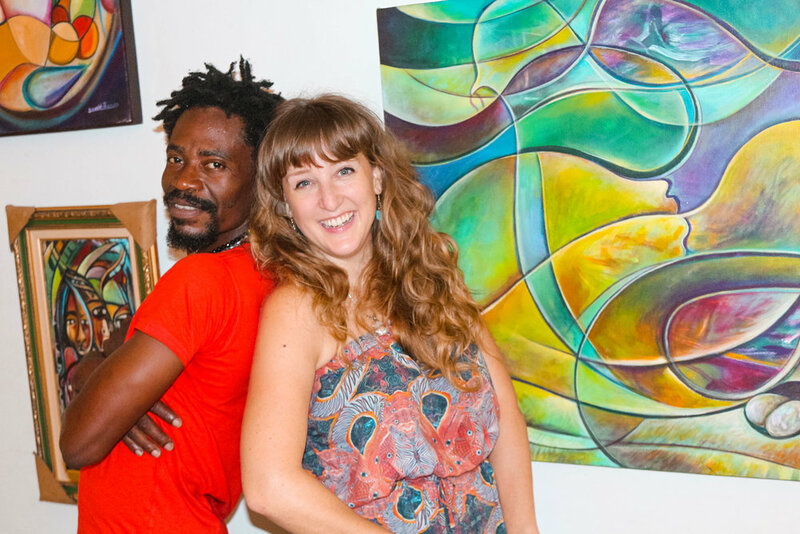 C’est une nouvelle collaboration entre l’artiste peintre Canadienne-Haitienne Amanacer (Emily Bauman) et Jerry Graffiti. La Sirène Urbaine et le Mur de Souhaits font partie des activités du festival d’art Ghetto Biennale 2017, le 11-17 décembre 2017. Venez nombreux avec vos souhaits et souries (activités gratuites). Parking sécurisé disponible sur place à Le Plaza Hotel. Come and paint your wishes and desires on a living mural. 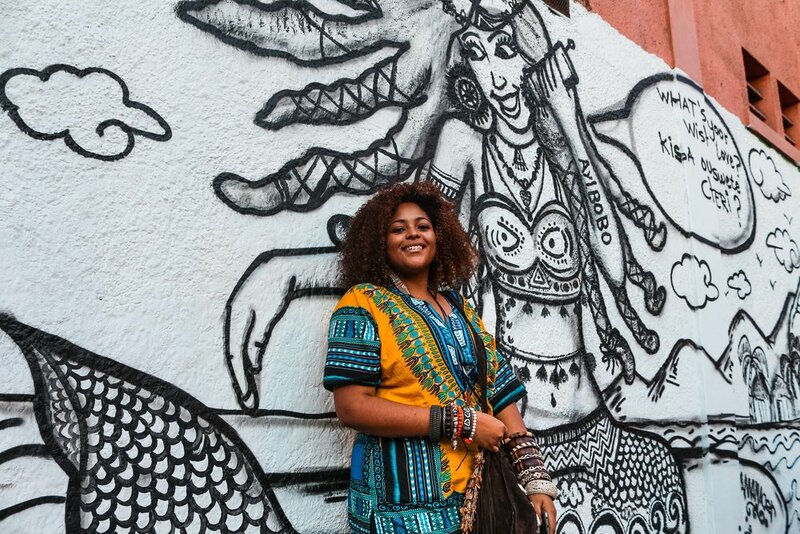 Meet the Urban Mermaid and pose for a photo with her lovely self. Or participate in the filming of a video on mermaid myths and legends in Haiti. The Urban Mermaid and Wishing Wall are created as part of the Ghetto Biennial 2017 Arts Festival happening from December 11-17 in Port-au-Prince. Come one, come all, with your wishes and your smiles (all activities are free). Time: 9am-12pm Friday 15 December and 12-5pm Saturday 16 December 2017. Secure parking available in the hotel parking lot. 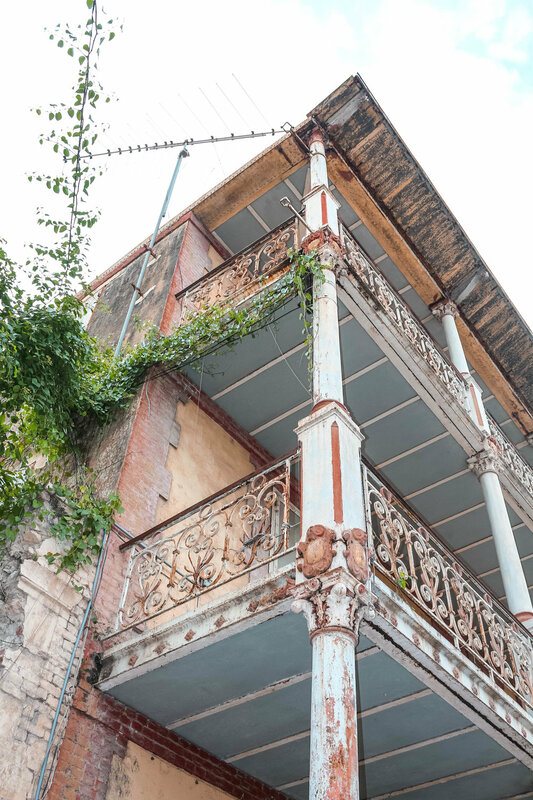 "The urban space of Port-au-Prince has a new and fascinating impact on traditional legends, magic, and storytelling. Canada-born, Haiti-raised visual artist Amanacer and Haitian street artist Jerry Graffiti will explore the question "How do rural expressions of magical rituals, and knowledge get translated into Port-au-Prince’s urban consciousness?" This question will be explored through the creation of an interactive mural that elicits the stories around a particular magical being: the voudou mermaid goddess LaSirenn. 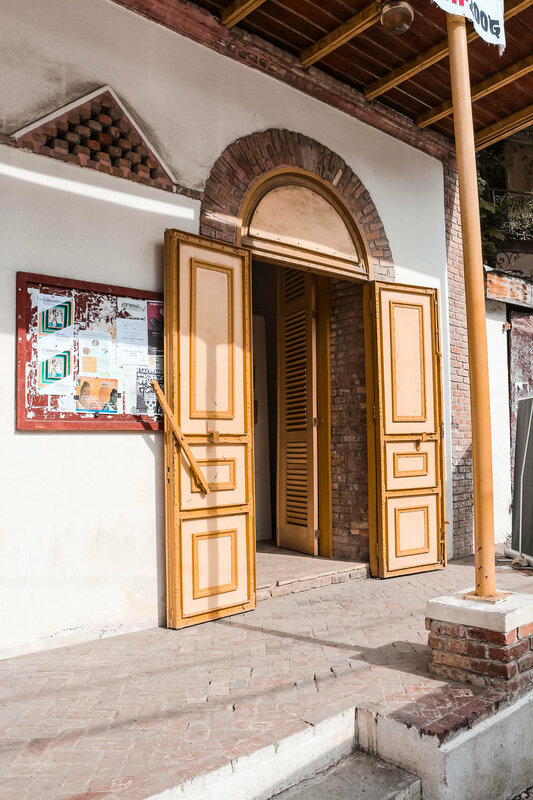 LaSirenn's religious significance in contemporary vodou, her magic, and everyday encounters in urban consciousness of Haiti will be explored through a week-long project "LaSirenn Urbaine." Introducing the most versaitle piece of fine-art you've imagined. 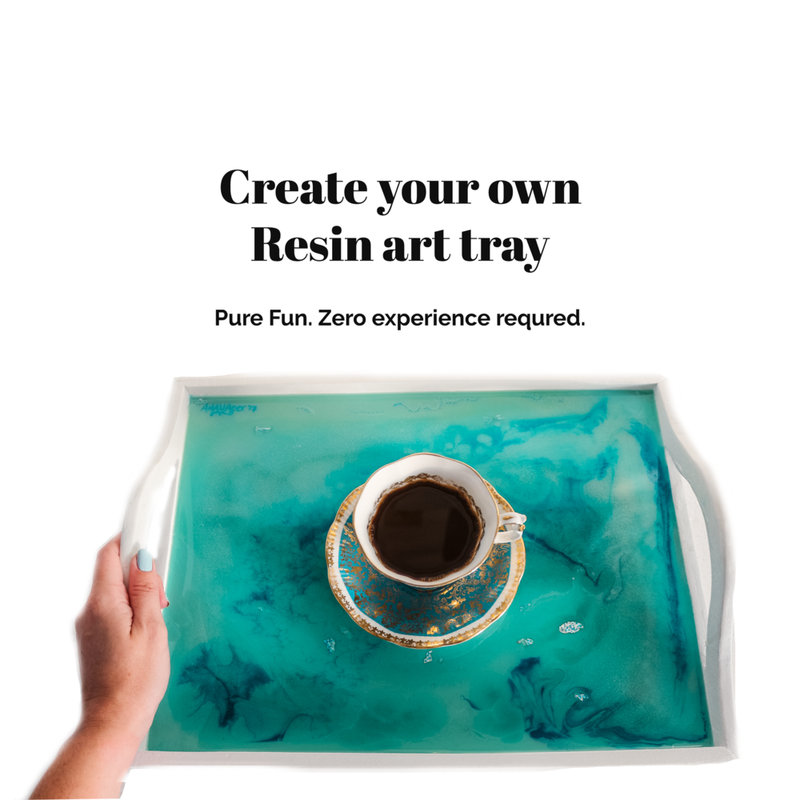 Is is it a resin art table or tray, or both? 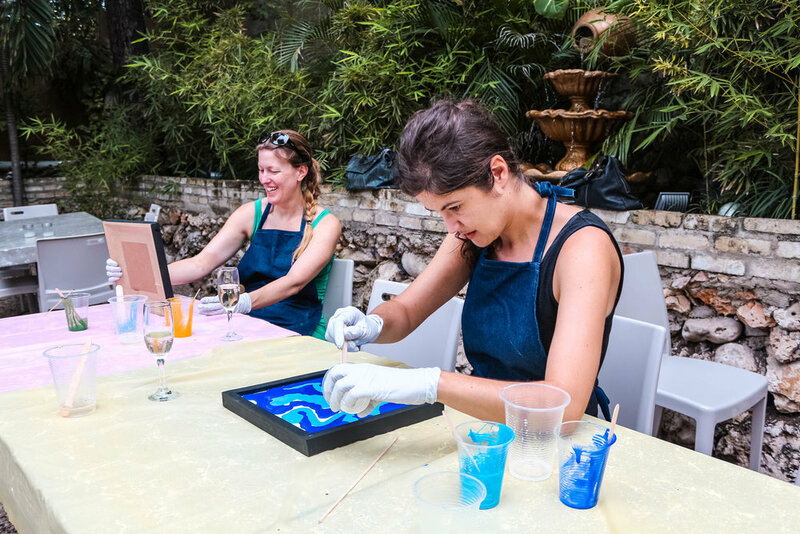 On October 21st 2017, I had the pleasure of hosting two more Sip & Pour Resin Art classes at Magdoos Restaurant in Petion,Ville Haiti. 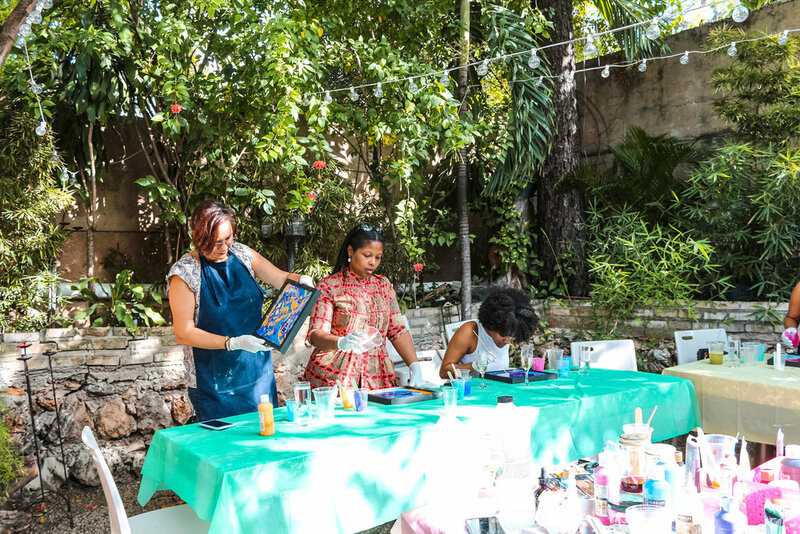 With help from Isabelle, we taught 22 lucky ladies (and 1 charming Brazilian gentleman) from 7 countries how to create their own resin art masterpieces. Once again, I was impressed by how freakin unique and individual each creation turned out. After just 2 hours they went home with gallery quality art. But don't take my word for it, just check out the photo evidence below! Thank you again to our generous hosts, the Mahfoud family at Magdoos Restaurant in Petion Ville. 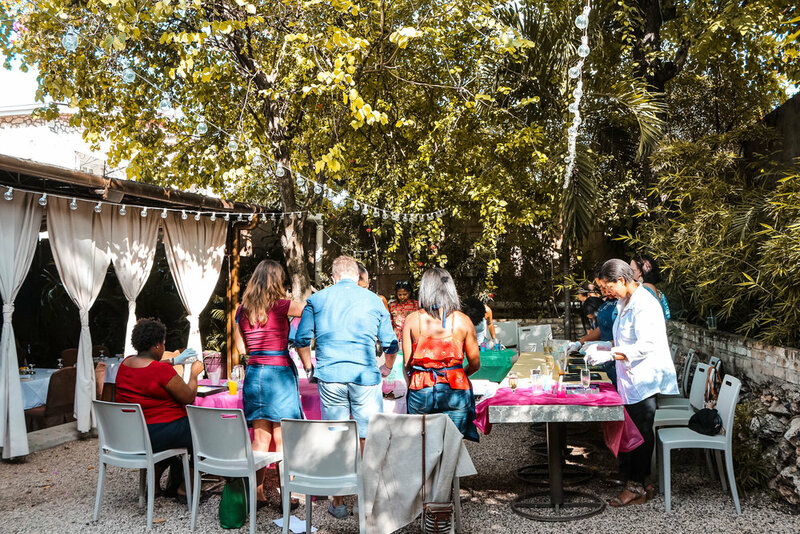 Your bohemian-Lebanese garden space and generous staff made this Sip & Pour event all the more memorable for us. 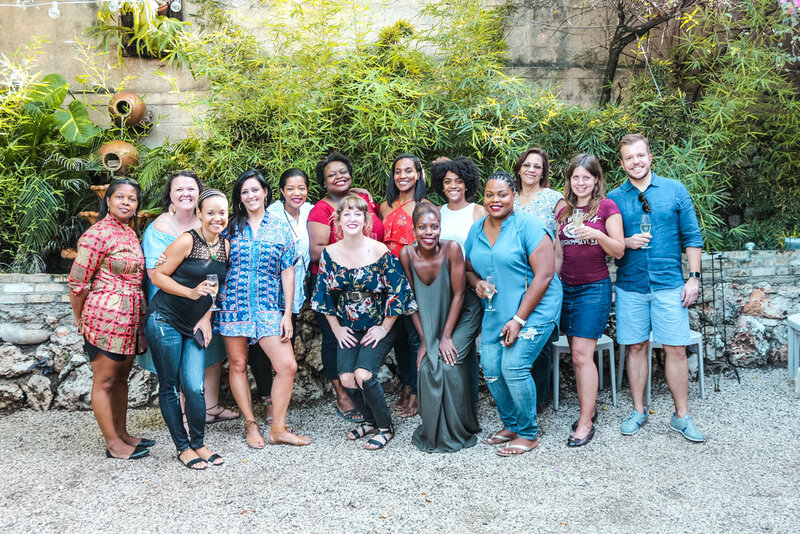 Are you interested in hosting a Sip & Pour event at your home in Haiti over the holidays? Just email HelloAmanacer@gmail.com and start gathering a group of 6-15 adults together to get the party rolling. Introducing the next Sip & Pour resin class on October 21st! 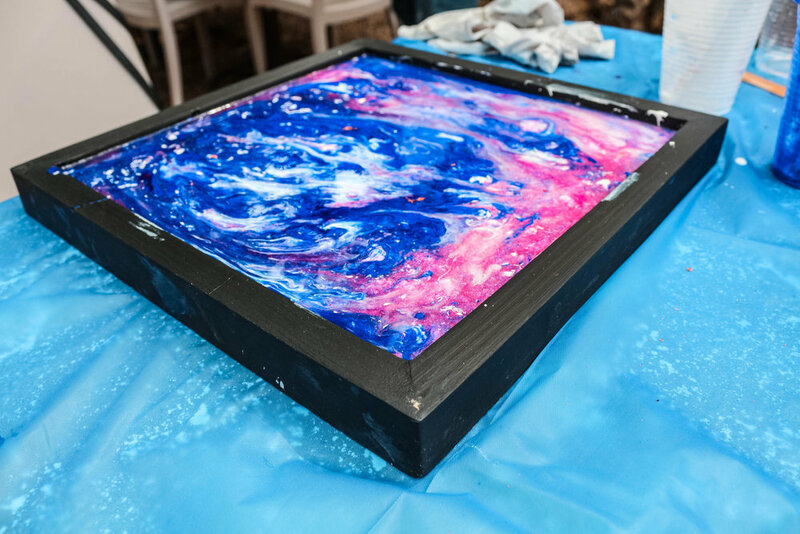 Zero experience is required to create a resin art masterpiece. 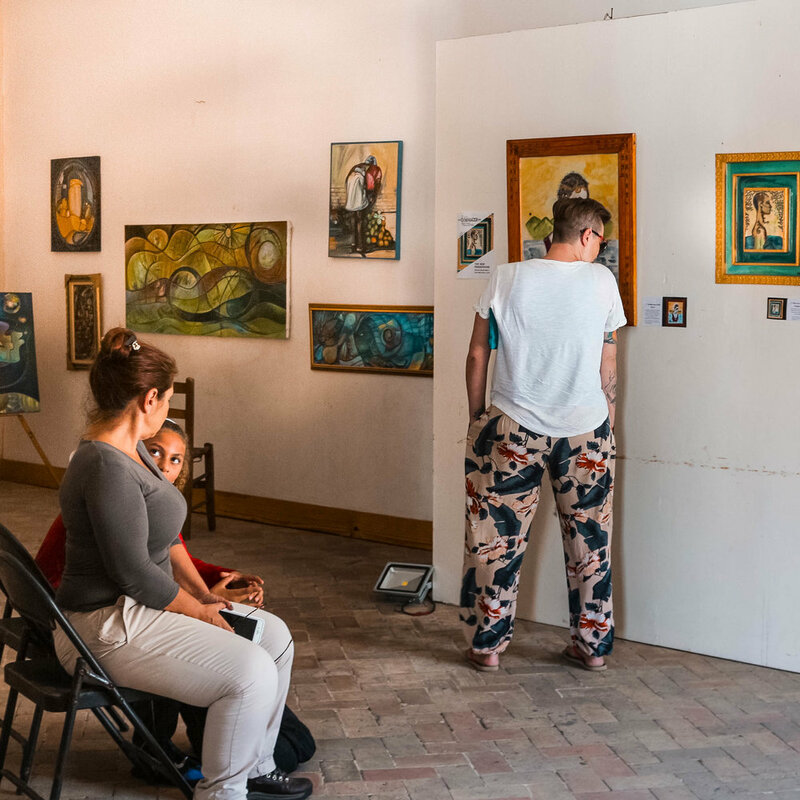 With an intimate class size and expert instruction from Amanacer (Emily Bauman) you're guaranteed to have fun and walk away with your own work of art. 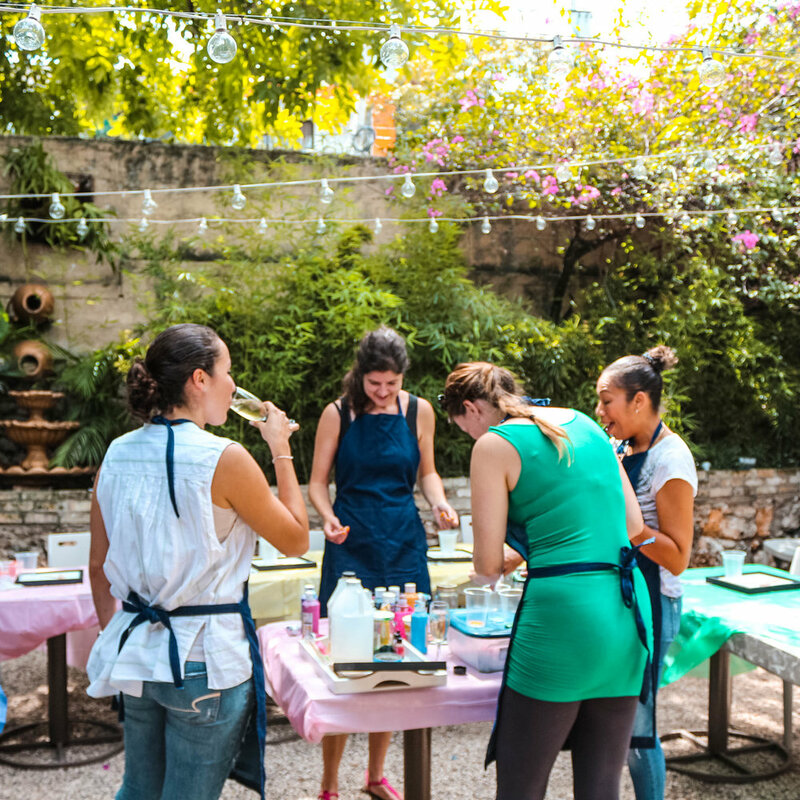 $75 all inclusive class fee, with bubbles and all the art supplies required. Click here for registration and full event information in Haiti. I'm in the mood to celebrate with you! 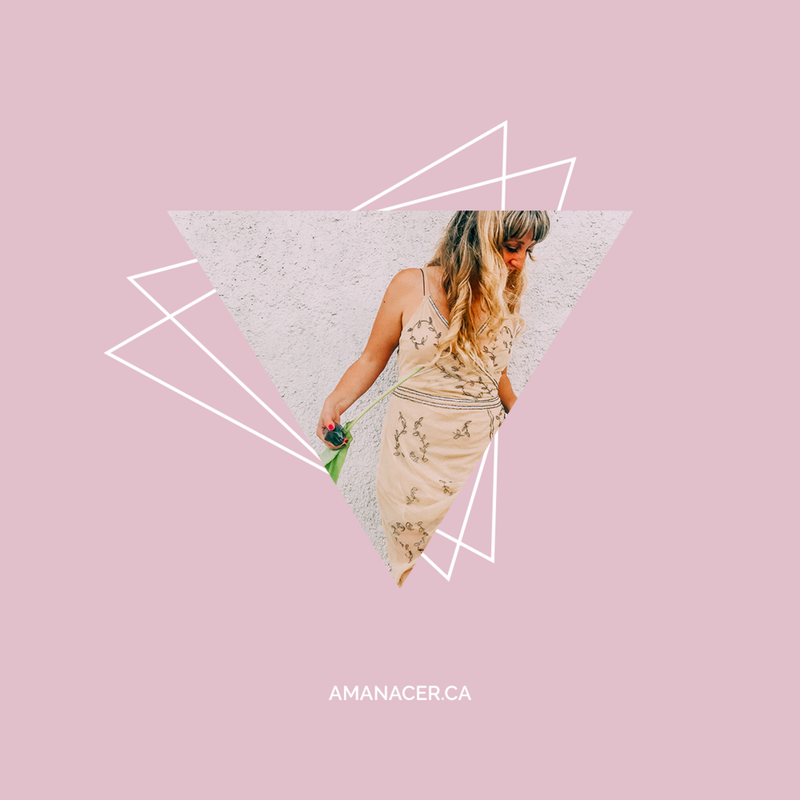 It's my birthday month AND I'm finally launching an international e-commerce store over at Amanacer.ca. Check out this post for all the details! What's your aesthetic? Could you sum it up in two or three words? Regardless of your style, I believe that paintings, sculpture, books and photography are what give a home its soul. Below is a sneak peek into some corners of my home-studio that embody my tropical boho-luxe aesthetic. 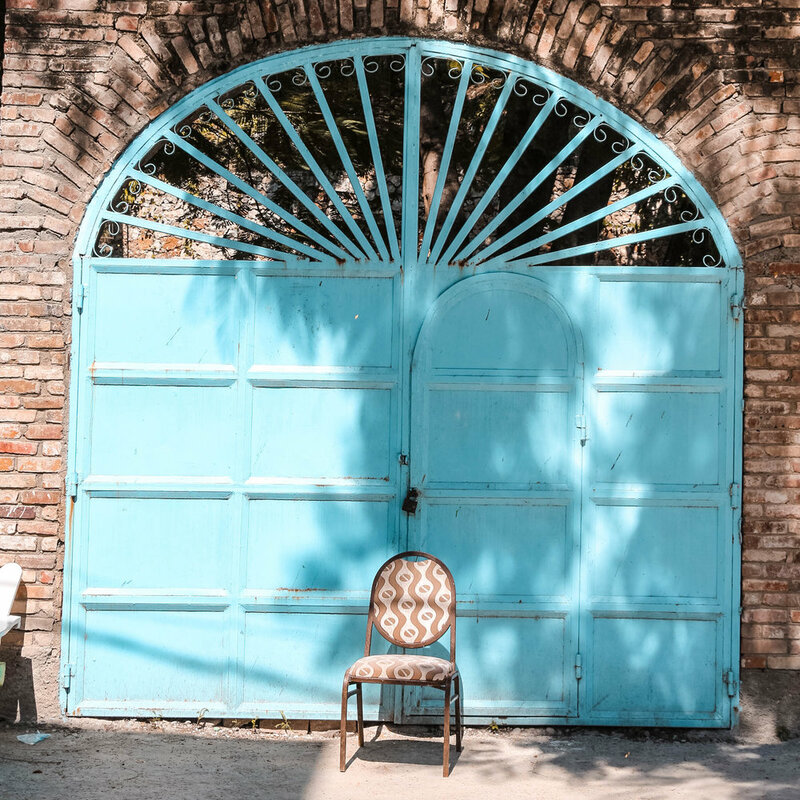 With the advent of social media and online inspo galore, we can all become the curators of our dream spaces. That's one of the sensibilities behind my friends at Volver Art, who believe life should be a living work of art. What a gorgeous idea, non!? "Through her art, Emily aims to create a sense of belonging. There is a sense of differences being reconciled across her body of work. 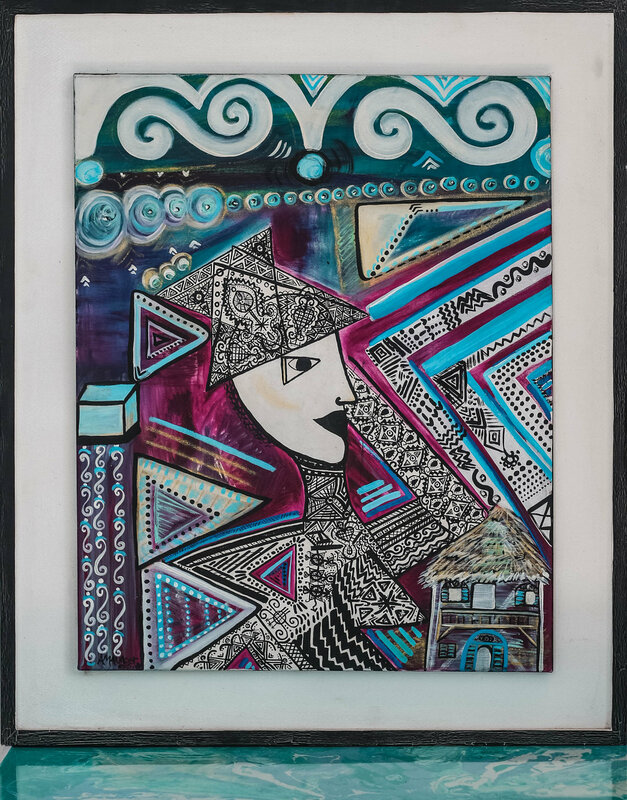 In her words, “Rich, mythical creatures from opposing traditions find a home on the same canvas.” She creates her own mythical world, replete with its own symbols and meaning. Emily’s sensibilities speak to art’s ability to cut across differences in traditions and bring people back together. They also give pause for thought about art’s capacity to make people feel at home." Sarah, of Volver Art has a beautiful way with words, and I love that she aims for "poetry not perfection." For the full in-depth interview and more of Volver Art's coverage of artists, you can check out their page here! 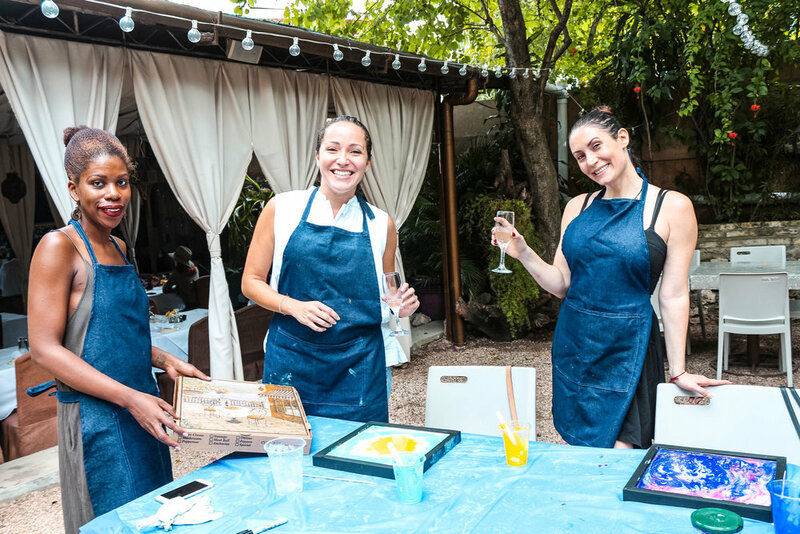 The first ever resin art “Sip & Pour” event is finally happening in Port-au-Prince. 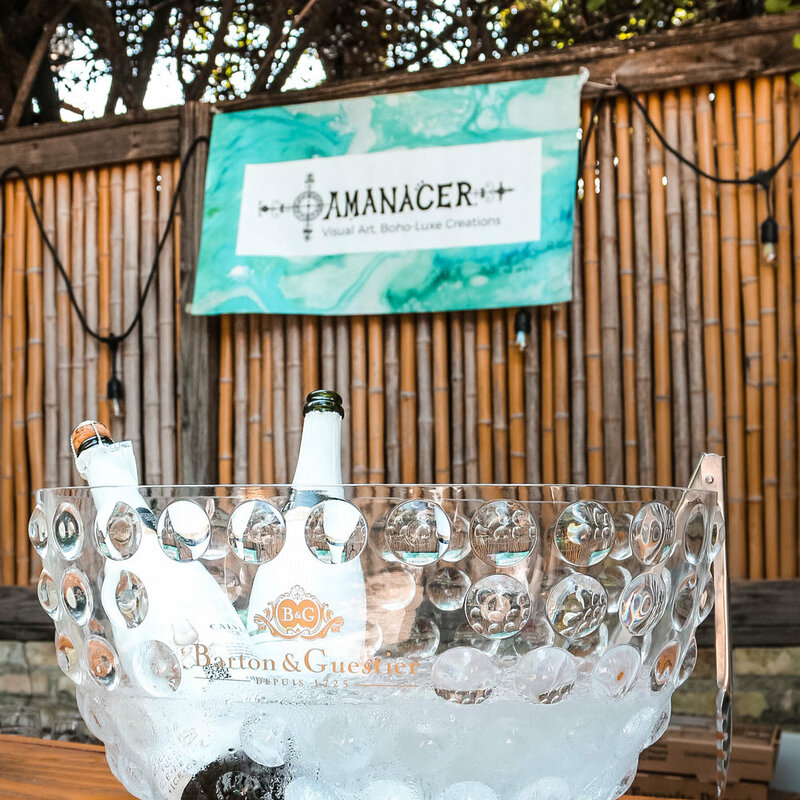 Put aside your to-do list for a Saturday to experience the fun. 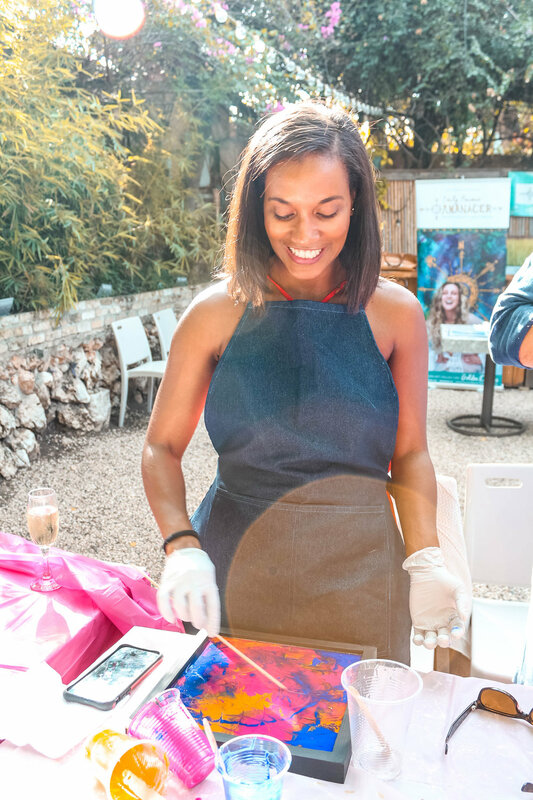 You’ll be pouring resin into a custom frame and walking away with a gallery quality art piece. Zero experience required. Did I mention bubbles are included? Sign up today for one of two time slots. Very limited spaces to create a tailored experience. Where: Magdoos Restaurant in Petion Ville, Haiti. Why: Forget about your to-do list this Saturday and try something new! Come with your friends, sister, your partner or just you and your sense of adventure.